When famed Smashing Pumpkins drummer Jimmy Chamberlin quit, or was fired from the Smashing Pumpkins in 2009, he focused his attention on the Jimmy Chamberlin Complex. The result has been good with the Complex’s 2005 debut Life Begins Again starting the freewheeling and colorful musical journey. 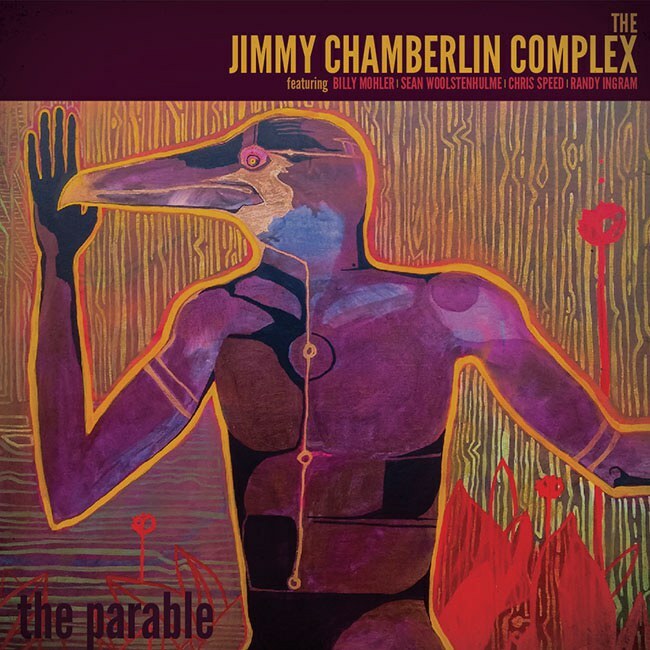 Jimmy Chamberlin Complex has just released their next album, The Parable, on Make Records. The long-awaited second album, throws out the template that worked so well on Life Begins Again. The resulting sound is a mixture of styles and colors that mixes a conventional jazz sound with more progressive shades of fusion. Guitarist Sean Woolstenhulme and bassist Billy Mohler remain from the previous lineup, while pianist Randy Ingram and saxophonist Chris Speed join to round the lineup out. The date presents six originals that are creatively unfolded with high spirits and big ears. The title track is a good example of the spontaneity that the group was able to achieve with the aforementioned process. The groove and the pulse are established right from the start. The melody unfolds with Speed carrying the melodic line and Woolstenhulme keeping the melody in his chordal movements. Chamberlin’s drumming is interactive, and his snare work is amazing as always. Speed takes the first ride followed by Ingram. Both solos are melodic and build in musical arcs. Mohler and Chamberlin lock in on a groove and the two create a pad that supports the music and moves it along. Woolstenhulme’s colors are very interesting and add to the overall track and texture. “Dance of the Grebe” will remind jazz fans of Dave Holland’s Conference of the Birds, using jazz to mimic certain aviary call patterns. Chamberlin further explains about the tune, “The dance of the grebe is cool, right? If you’ve never seen it, you would never forget it. It’s like, what the hell is that bird doing, man?” Each player supports each other’s strengths to create a group sound from the inside out. This is certainly a band effort. Woolstenhulme’s solo is a musical journey full of new context for the jazz language. Mohler’s big bass sound heads to the solo role as he turns in a melodic and musical statement. Overall, this track has a lot to offer the listener and the band’s conversation is well worth listening to. Overall, The Parable is a wonderful next evolution in Chamberlin’s journey from pumpkin to butterfly. Sometimes, when the door shuts and the window opens, it really is kismet.